Ahmedabad (India) - India's first bullet train project, a $19-billion initiative linking Ahmedabad to Mumbai, was launched Thursday as Indian Prime Minister Narendra Modi and Japanese counterpart Shinzo Abe hailed fast-growing ties between Asia's two biggest democracies. The project is seen as emblematic of warming relations between New Delhi and Tokyo, who are seeking to combat China's growing regional influence. The high-speed link, which will use Japanese technology to connect the main city of Modi's home state with India's financial capital, is scheduled for completion by December 2023. "I hope to enjoy the beauty of India through the windows of the bullet train with Modi on my side when I come to India in a few years," Abe told a ceremony in Ahmedabad. "It marks the beginning of a new chapter in ties between India and Japan," he added. "The Indo-Japan relationship is not just about bilateral trade. It has developed into a strategic and global partnership in the Indian-Pacific region," Abe said. His visit comes just after a border standoff between India and China in a disputed and strategically important Himalayan area. Local media reports said Japan was likely to take up the sale of ShinMaywa US-2 amphibious aircraft that India has been interested in for several years. The aircraft is expected to boost India's maritime capabilities. 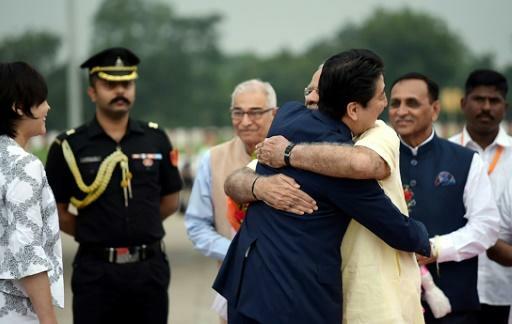 Modi welcomed Abe at the airport with his traditional big hug before the Japanese premier and his wife changed into traditional Indian dress. Japan is providing 85 percent of the cost of the new train link in soft loans. India's first bullet train project, a $19-billion initiative linking Ahmedabad to Mumbai, was launched Thursday as Indian Prime Minister Narendra Modi and Japanese counterpart Shinzo Abe hailed fast-growing ties between Asia's two biggest democracies.